One of the first diy improvements we did to our home when we moved in was painting the front door. It’s a little unconventional, but it gives architectural detail, a pop of color and dimension to a feature that could otherwise just blend in. We actually loved the results so much, we painted our back door too (green!). My friend Rae and I are working on her entry (see the design ideas here) and one of the first steps was to give the space some character by painting the door a fun color. Rae picked out two colors – a bright yellow and pretty turquoise – and after trying out both, we decided to just go crazy and pick sunshiny yellow. We used semi-gloss interior latex and just started brushing it on. I only stayed for one coat, but Rae added one more once it was dry to really cover and saturate the color. I’ll post finished photos as we make progress with the next steps … hanging a new light fixture, artwork, hooks on the wall and a rolling crate for shoes. Even with one coat, it was fun to see how much the door brightened the space and gave it a jolt of unexpected energy. 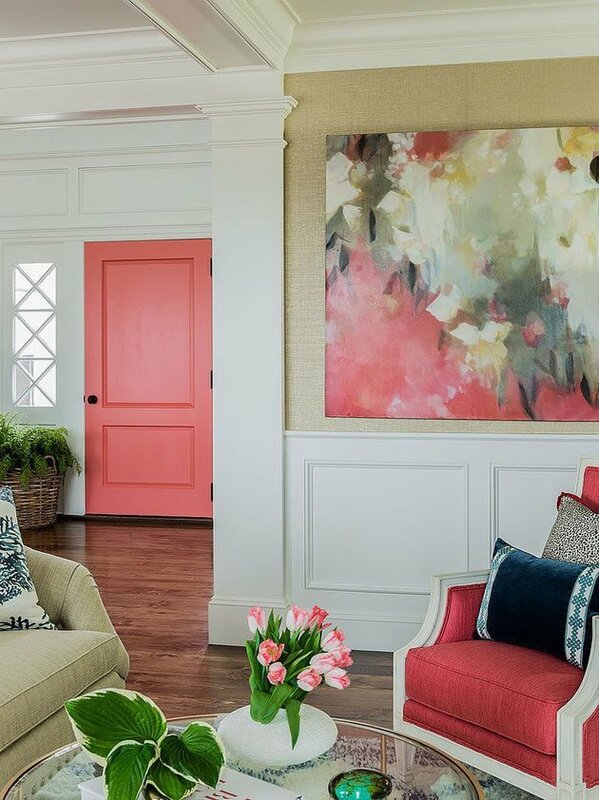 In case you need a bit more inspiration to convince you that painting the inside of your front door is a great idea, here are some gorgeous examples. Have a boring front door that needs some life? Try painting it a favorite color. I think you’ll love it. Thank you for sharing this. Absolutely love the coral! Any idea on paint color/manufacturer? TY! I painted my back and front doors on the first floor a bright yellow (similar to the picture above). I also painted my pantry door in the kitchen bring yellow. Question: I have two other doors on the first floor (one leading to the basement and one leading to the powder room) Do I have to paint them bring yellow too? Or is it okay to paint them cream like my walls? Thanks so much. I don’t think there are any rules. If you want things super consistent, try painting them all the same. But painting them the color of your walls will look really nice and seamless as well. We just painted our pantry door and the interior front door carbon copy black. Love it! Now we are deciding if we want to keep the side lights white like the trim, or paint them the same color as the door? Any suggestions are welcomed! This is such an awesome idea! You can make it to have some bright pop inside the home or just to complement your overall interior design. A must-try! I love the colored front door! We don’t have an entry way, our front door opens right into our family room. We have a small house. Do you think a painted front door would be too overwhelming in a small space? Ok may be a dumb question but the door is the same color both interior and exterior correct. I have a black door that looks great outside but not so sure I want black inside- I would need to consider a whole knew color if the door is the same front as back correct? No! We’re doing Rae’s door navy on the outside and yellow on the inside. And our back door is green inside and white outside. I’m not sure if there is a ‘rule’ about having a door two different colors, but if so, we’re breaking it! My front door is black on the outside and was white inside. I painted it black and am loving it! Adds so much to the entry. Oh man, oh man. That last shot with the aqua door and the white everything else with the pops of black is making my heart go pitter-patter. I actually have two painted interior doors–the french doors that lead to our back patio (so make that three? ), which I painted Sherwin William’s Quietude (and then stenciled using a version of your wallpaper template), and the door to our garage, which is a raspberry shade…that only has one coat on it…still…after two years. Ahem. I have been so, SO tempted to do this with my old (1884) front door… It’s oak with a dark stain, and a lighter color would go a (very) long way to brightening up the entrance. So, what’s stopping me? … I’ll be selling my home this summer, and I’m worried that I’d be ‘devaluing’ the property. The same old painted wood vs. clear finish debate. Has anyone had experience with this – or heard any positive/negative comments regarding home selling? Painted my door a famous Martha color called “Darkening Sky”. She got it all wrong it should be named “Makes Me Happy Blue”! – particularly in the Pacific NW. I love colorful doors… and that dog in your picture! Thanks for all your inspiration – you are wonderful. I absolutely LOVE your blog! Thank you for all your DIY and post! I am doing this project in my house! Great idea! I am getting ready to paint the outside of my front door, I am going to paint it every season. Never thought of painting the inside but love the idea and I am going to do it. I love bright colors. Very inspiring , that salmon is beautiful. Where did you get the rug that is by your door that you painted? Beautiful, I love the bright yellow. :) Our front door is teal on the inside and I love love love it! 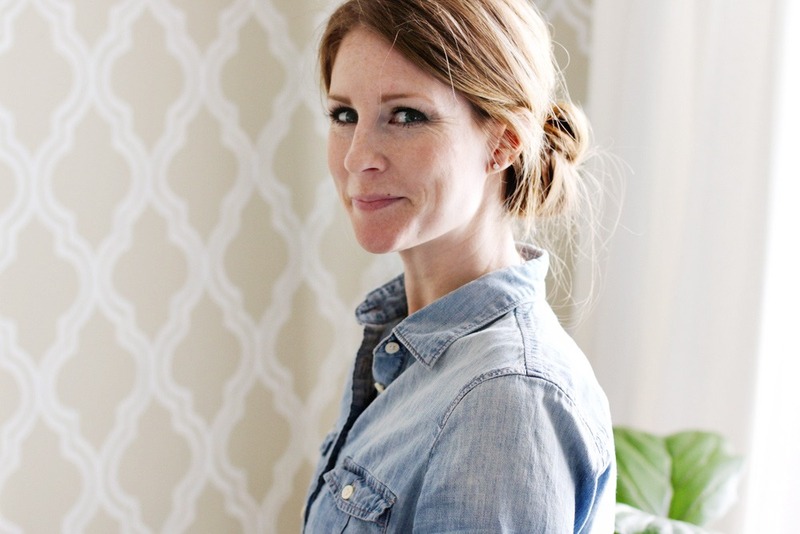 http://askannamoseley.com/2014/09/entryway-makeover-bhg/. I’m looking forward to painting the kitchen door that leads to the garage (as soon as I paint the kitchen.) What are your thoughts about painting the front door the exact same color as the walls? Currently our living room walls are greyish green and the double doors are white. Love this idea! We painted the inside of our front doors last summer. It took me almost two years to convince my husband that it was a good idea and to agree to let me do it. Thank goodness I was able to show him examples on my Pinterest boards so that he could see what it would look like. We also changed all of the door knobs and hinges on every door in our home which made a huge difference as well. We went from 1990’s brass to oil rubbed bronze with beautiful glass knobs. I love all of these examples! I painted the outside of my front door right away, and then a year later, stripped the inside of my door down to bare wood instead of the white. It felt so bland before that. Seeing these examples, I think I’m going to paint the inside of my back door! Now I just have to pick a color!